When Chef Irfan told his Lucknow-based parents that he wanted to join hotel school, they were happy enough. But when he decided to specialize in kitchen rather than front office or food and beverage service, his businessman father couldn’t understand it. “In our khandaan, we call cooks to our house to tickle our palates; nobody from the family has ever gone out and cooked for somebody else. Come home and join my business.” But becoming an Army contractor was never in Irfan’s scheme of things. The year was 2001, the month September and the date 11th when Irfan started doing the rounds of hotels to work in. He got offers for every other job in the world, including one at GE Capital, but none for a chef. But then, when Irfan sets his heart on something, he makes sure he gets it, no matter what it takes. So stick to the kitchen he did but even he never thought he would zoom from Commis Three to Master Chef in nine short years. However, he has a unique qualification. He has professional training to back him up, but his home is in Lucknow’s Sadar Bazar, not far from the first family of Lucknavi cuisine: the Qureshis. So he has been born into a family that cooks qormas and kebabs the Lucknow way. He has been taught Indian cuisine and the science behind it on one hand; on the other, he carries the flavour profile of Lucknow in his DNA. He has specialized in Indian cookery, though he knows the basics of western and oriental cooking too. 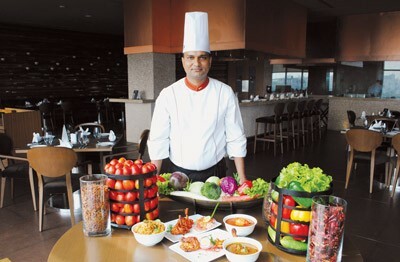 When he joined Radisson Blu, Paschim Vihar as a Master Chef, and was given the task of creating the menu of Indyaki, his biggest challenges were to learn the “tricks” associated with teppanyaki cooking and hiring junior chefs who had good interpersonal skills, were familiar with flair cooking in a teppanyaki set-up and could cook well! The other task of actually making a menu that would pass muster at the corporate level – the Carlsson group who own the Radisson brand control the concepts at their various units. “Head office wanted more fusion and I wanted more purity of Indian cuisine with just the method of cooking to be the ‘foreign’ element and finally they saw reason. Success really does come to the patient, and Irfan managed to master the intricacies of flair cooking by practicing with tossing bottles in the air at home and discovering manifold ways of holding pens. The other factor that Irfan wants to overcome for the rest of his working life is that of the fear of the unknown. He secretly grits his teeth when old, khandaani master chefs proclaim that educated chefs can never cook or that if you don’t have the inherited ability to use an iron tandoor, you may as well forget it. khamiri need the relatively low temperatures of an iron tandoor. On the minus side, it is not for the novice!